Item # 317115 Stash Points: 7,995 (?) This is the number of points you get in The Zumiez Stash for purchasing this item. Stash points are redeemable for exclusive rewards only available to Zumiez Stash members. To redeem your points check out the rewards catalog on thestash.zumiez.com. 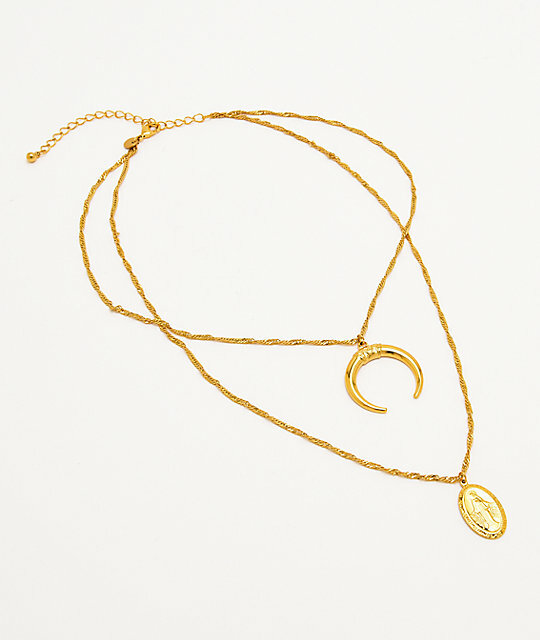 Shake up your accessory collection with The Gold Gods Layered Crescent and Virgin Mary 20" Gold Chain Necklace. Featuring dueling pendants and a double layered chain, this necklace comes complete with a large half moon crescent pendant as well as a circular virgin Mary pendant side by side for a strikingly original look. Dueling 2mm chains provide additional originality while PVD plating throughout the entirety keeps with this necklace's strikingly classy appearance. 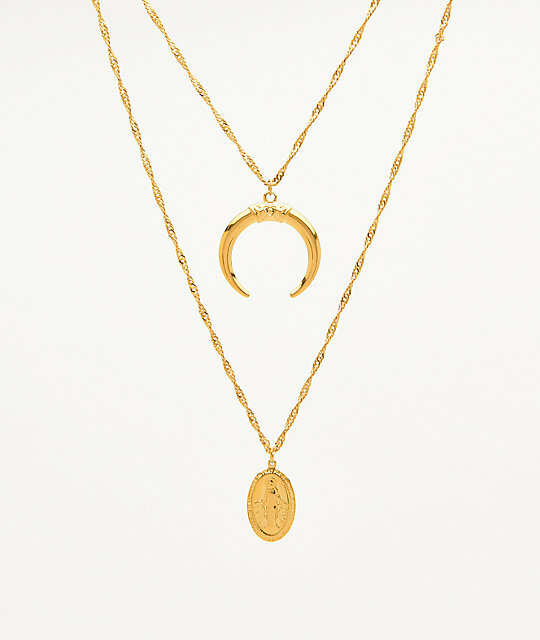 Layered Crescent and Virgin Mary 20" Gold Chain Necklace by The Gold Gods. Engraved and gold PVD plated pendants in the shape of virgin Mary and a crescent moon. 18k Yellow Gold Colored PVD Plated throughout. Durable locking clasp for a secure fit. Mary pendant: .5" x .75" (1.25cm x .2cm) | Crescent pendant diameter: 1" (2.5cm).